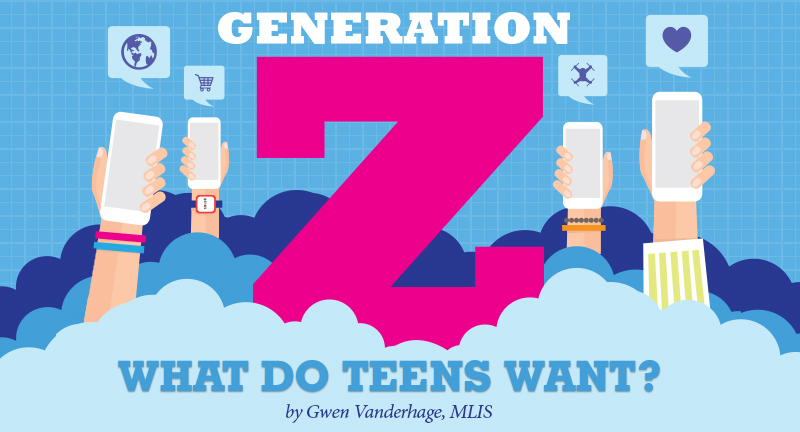 If you are working with teens in your library, you may have already begun to investigate the nuances of “Generation Z.” If not, don’t worry—you still have time. Over the last couple of years, there have been numerous articles and studies examining what makes the generation of people born between 1996 and 2011 different from Millennials. These are the young adults now entering the workforce, the tweens and teens in your Makerspaces, and the kids in your after-school programs. These young people access and process information in ways, and at speeds, we can’t even imagine. Researchers say they are more serious, more entrepreneurial, and more culturally and ethnically diverse than the generation that precedes them. “What do teens want?” is a question we wrestle with in the library every day. How do we keep kids reading? How do we keep kids coming to the library when they’re old enough for sports and other extracurricular activities? How do we turn these kids into adults who advocate and vote to support libraries? As a collection development librarian, giving readers what they want is my primary goal. Every year at the two American Library Association conferences I attend, I make sure to attend a “teen feedback session,” where the YALSA Best Fiction for Young Adults committee invites local teens to come up to the mic and share their opinions about the year’s best books. I am always impressed and moved by the nuanced reading, articulate opinions, and humor shared by these teens in front of a room packed with a hundred or so adults. These young people are from diverse backgrounds and seek characters who not only reflect the particular circumstances they see around them, but reflect the hard truths about growing up in a difficult world. They are looking for authentic characters with authentic voices. The shifting genres in young adult publishing reflect this, as well. By far the biggest publishing trends aimed at Generation Z are realistic fiction, dystopian novels...and political intrigue set in space (“dystopian science fiction,” maybe?). National Public Radio recently aired a story set in a library book club, in which the teens talked about why they gravitate toward dystopian plots. While we librarians have always said, “Oh, high school IS a dystopia, that’s why these are so popular,” it is more than that now. These teens are already burdened by a nonstop barrage of heavy world news, environmental fears, and a constantly shifting set of cultural norms. As a result, today's young people relate to dystopia more than ever. Publishers are doing a better job of finding and marketing authors of diverse ethnic backgrounds and also diverse points of view. Teens are finding titles featuring black, brown, biracial, and other ethnic characters in every kind of setting: romances, gritty urban stories, facing parental pressures, and starring on reality TV in space. Readers are able to find characters who are asexual, bisexual, homosexual, transsexual—or raised by parents who are. And increasingly, these characters are facing dilemmas other than their sexuality, thereby taking sexual identity out of “problem novel” status. Librarians can help support this newest generation by creating a library collection full of titles for every kind of reader, about characters we may not see in our library, but whom kids will encounter in the world. We can create an environment that is open to questions and conversations. The library is for everyone; it’s time to share that wonderful philosophy with a new generation of readers.